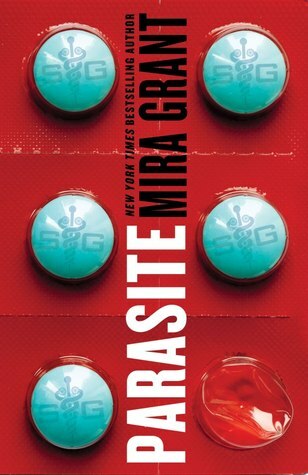 Mira Grant sucked me in a few years ago with Feed, the beginning of her trilogy of journalists vs. zombies, and I've been sold ever since. I love the way she sticks some creepy sci-fi horror scenarios into a near-future world that isn't too far off from ours. Parasite is no exception to this, as it's set in the somewhat near future and is based on a set of circumstances that, while far out, at their core seem plausible. And that's perhaps the most horrific part of Grant's stories. There are no vampires or mysterious curses or paranormal goings-on. In Parasite, in response to the challenges of healthcare, in addition to other problems like antibiotic-resistant infections, lowered immune systems, etc., a solution is born that is straight out of a mad scientist's lab: tapeworms. Mix in a secretive pharmaceutical company, the government, and consumers being so happy they don't have to take pills anymore that no one questions these tapeworms and you've got a recipe for disaster. The solution is a little far fetched -- we as a country can't even agree on solutions to our healthcare woes, but less than 20 years in the future we'll willingly ingest tapeworms? -- but the cause of this all is way, way too easy to believe. Our main character is Sal, a young woman who woke up from a coma a completely changed person. She had no memory of her life before the accident that put her in the coma, and she had to relearn all life functions: talking, reading, walking, etc. The theory is that her tapeworm is what actually saved her life and brought her out of the coma, which turns Sal into a bit of a medical miracle, and also makes her into the pet science project of the higher-ups at SymboGen, who want to know how exactly the tapeworm helped her recover. We get to know Sal and her new, rebuilt life: a job working at an animal shelter, a somewhat awkward relationship with a family she doesn't remember, a boyfriend who loves her for who she is. In the midst of all of this, though, people start coming down with what's dubbed "sleeping sickness": they just go totally blank and shamble along, but have no apparent ability to communicate or even think. Sal, and later her boyfriend, find themselves involved in the investigation into this sickness in ways that they never could have imagined, and they are poised to blow a conspiracy wide open, if they can get out of all of this alive. Sal is a bit of a tough nut to crack. She can be somewhat naive at times, given the fact that she's really only got six years of real-world experience under her belt, that she can remember. She displays some extreme, sometimes annoying reactions to certain events and has some frustrating personality quirks. But you feel for her, because she had to learn to be a person all over again, so no wonder things are difficult for her. She grows a lot over the course of the book, as she's kind of whiny and spineless at the beginning, but by the end is much stronger, more decisive, and rational than the Sal we first met. The supporting cast is filled out with interesting characters, most of whom I can't really talk about without spoiling major plot twists. As I've mentioned before with Grant's books, she really excels at presenting a diverse cast. This isn't a future world inhabited by just stereotypically attractive straight white people. The universe of Parasite is populated by people of different genders, presentations, sexualities, abilities, beliefs, etc. It's refreshing to read anything that doesn't assume that white is the default and that makes the real effort to represent all types of people. I think where people sometimes go wrong with Mira Grant books is the fact that they're not always relentlessly action-packed. She does a lot to set up the world and get us invested in the characters, and sometimes that means a lot of dialogue and people hanging out, and very little scary scenes. Grant's terror is far more of the psychological horror variety: that creeping sensation that not all is right and that there's something Very Big going on. Yes, the creep-factor is high with this one, but it's not a mile-a-minute whirlwind of non-stop horror like you might want it to be. I love a good jump-out-of-your-seat scare, sure, but something a little slower is a nice change of pace, too. Now, for the things that didn't work for me. First, I was able to guess most of the major plot twists way, way in advance. While there is a big revelation at the very end of the story, I also had that one pegged about halfway through, so it didn't have the jaw-dropping impact that I wanted it to. Second, the more I read of Grant's work, the more I realize that her main characters all really do fall into that uber-sarcastic, snarky personality trait, which can get a bit overwhelming at times. I didn't mind it in Feed, but it is a pretty persistent pattern among her leads. Third, this book doesn't stand on its own at all. I feel like that's standard procedure now for books that have already been accepted as a series, but still, it kind of annoys me. Not having a "real" ending makes it harder to evaluate because you may have to wait years for the ground laid in this first book to actually pay off. Finally, there's just a ton of info-dumping, usually in the form of characters explaining things to Sal. Since she is still learning about how the world works, there are a lot of long scenes of people monologue-ing important information at her. You can't skip it because it's vital stuff to understand the world and the plot twists, but you also want more action and less drawn out conversations. I still loved Parasite, don't get me wrong. I didn't have that can't-put-it-down feeling that I get with books that really hook me, but I am definitely invested in the series and will be reading/preordering the next one whenever it exists. I'm not sure if I went easier on this book because I generally love Grant's stuff despite its flaws, or if I was harder on it because I know that she's capable of some really breathtaking, mind-blowing stuff. I think the real payoff/impact of the series will become clear once its over and all the answers are out there. If you're into slowly creeping psychological horror, I would definitely check this one out. If you hate cliffhanger endings, I'd put this on your wishlist until the next book in the series comes out.